The Town deserves to be called very good, being extremely well constructed and consistent in almost every aspect. It’s far from being the perfect genre flick, and perhaps with a bit more experience under his belt, director Ben Affleck in future will be able to iron out the kind of things that prevent it from truly being brilliant. Or rather, expand on others, because while it is severely entertaining, it spreads itself from action piece to heavy drama without truly capitalizing on either. His striking potential (as director) is completely cemented with The Town however, which followed his acclaimed debut, Gone Baby Gone. The film everyone seems to beg to compare it too is Michael Mann’s 1995 masterwork, Heat. There are a few moments that homage that film, but overall, there seems to be little in common besides the central figures being bank robbers; the epic nature of Heat is also virtually absent. 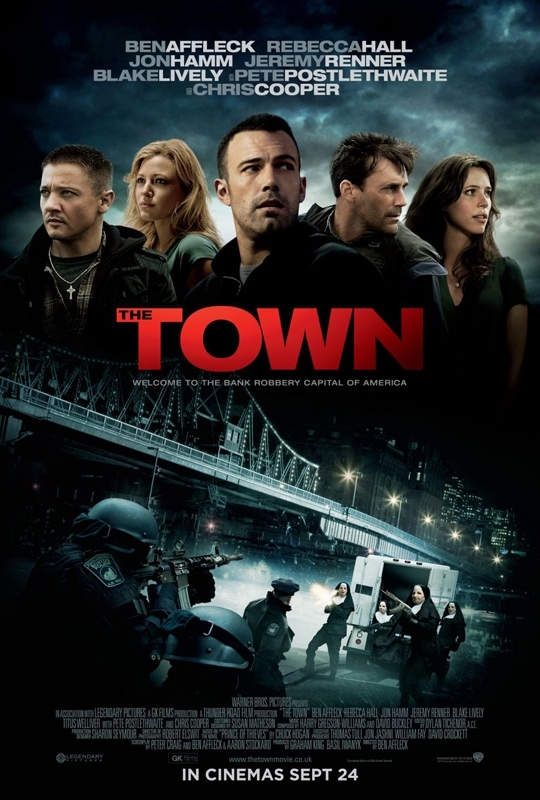 The Town, despite the action, does feel less a traditional heist movie than an urban drama anyway, merely set amongst the lifestyle. That’s a good thing, separating itself and becoming fairly unique - regardless of the clichéd nature of some of the story. The Boston location probably helps in this regard too. From an editing point of view, it is really well balanced and tight with it‘s set pieces. Think the last two Bourne films, but dropped down a few notches. In fact, no scene really feels out of place or wasted. Affleck is on his way to being to Boston what Scorsese or Allen is to New York too. Just like in his debut film, the city and it's people are showcased with gritty love. The film has a truly urban feel. Co-stars Jeremy Renner and Rebecca Hall were great; Renner particularly convincing, and cameo appearances by veteran Pete Postlethwaite were excellent. John Hamm, as the lead FBI agent, is a surprising asset. Shedding his Don Draper persona (from TV’s Mad Men) with ease while given some cracking dialogue, Hamm definitely stamps his presence on the movie. Ben Affleck I felt however, was pretty impressive. His best performance since perhaps Good Will Hunting. Most of all though, every character is realised very well. The crew especially - you didn't question the authenticity of these guys; they were hardened 20-something crims and you believed it. The flaws are notable but didn’t bring the film down for me - for some they will. Despite being a genre institution, predictable is a word that can definitely apply to the overall story, but mainly it was the central relationship between Affleck and Hall, that lacked believability considering the circumstances, that hurts the film the most. The motivation from both sides are muddled here, and even though it did service the story well, it also led to an ending that was…well, the schmaltz really was a bit much for me personally. Think "chick flick" territory. The final set piece was possibly slightly underwhelming too, even though it’s clear to me, the robberies themselves are not meant to be the focus. The action direction regardless was first rate. Affleck’s robust direction throughout, keeping the story tight and streamlined, along with engaging dialogue and great performances make The Town worth your time, if the blueprint is your type of thing of course.